Before the fall. 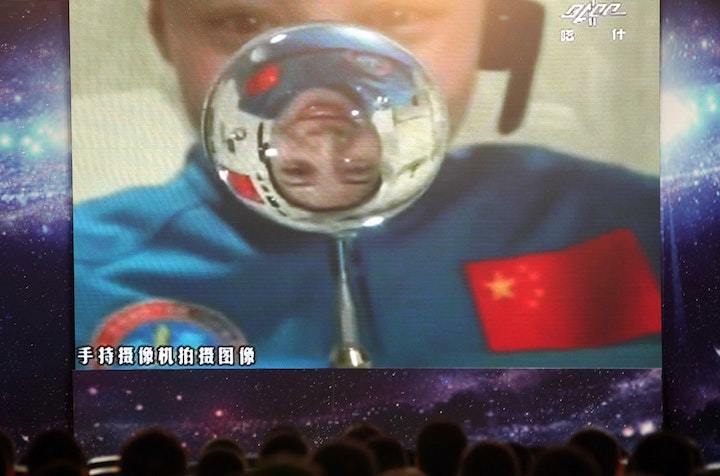 Tiangong-1 astronaut playing with water in zero-gravity, during a broadcast in 2013. Scientists studying the demise of China’s Tiangong-1 space station are uncovering information that can help them understand the effects of the Earth’s atmosphere on space debris and the risks posed when pieces of old satellites eventually fall back to Earth. Tiangong-1, the name of which means “heavenly palace”, was China’s first space station. It orbited Earth from 2011 until 2 April 2018, when it fell into the South Pacific Ocean, northwest of Tahiti, becoming the largest piece of space debris to hit the planet since the Russian Mir space station made a controlled re-entry near Fiji in 2001. Tracking Tiangong-1 was important, says Vishnu Reddy, a professor of planetary sciences at the University of Arizona, Tucson, US, because the manner in which its orbit decayed helped scientists understand how the Earth’s tenuous outermost atmosphere exerts drag on such objects, gradually slowing them until they can no longer stay aloft. This, he says, is useful in helping determine how soon a myriad smaller pieces of space debris might also come down, reducing outer-space clutter and the risk it poses to important satellites. But watching the Chinese space station’s final days was also a useful exercise in trying to predict where it might come down, says Ettore Perozzi, head the Italian Space Agency’s Space Situational Awareness Office, who discussed the matter last month at a conference in Darmstadt, Germany. In part, that was simply because it posed a useful opportunity to polish up on techniques. But it was also of public safety interest to his team, because some of Tiangong’s orbital tracks crossed Italy. In fact, he says, the Italian Civil Protection Department and other agencies set up a board to monitor the space station’s final days. “We spent Easter weekend in operational mode,” he says. Not that the risk was all that large. “The chance to actually hit a populated area was very small if one considers that two-thirds of the planet is covered by oceans and that people tend to live clustered in cities and coastal areas,” he explains. Or, as Reddy puts it, “Earth is big”. But parts of the space station, which was about the size of a tour bus and weighed 8.5 tonnes, were capable of surviving the fiery plunge, including fuel tanks, steel gyroscopes, and other large components. There was also a possibility that the fuel tanks might contain highly toxic hydrazine fuel, a hazard to curious individuals drawn to them after they hit ground. And while, to date, nobody has ever been hit by a piece of space debris – or, for that matter, an asteroid – technology has advanced to the point where such an event, should it occur, shouldn’t be dismissed as “bad luck”, Perozzi says. Rather, he notes, as we increasingly become a “space civilisation” we need to start viewing the risks of such events the same way we view other risks – as something to prepare for in order to avoid or mitigate their dangers. In the case of space stations and satellites, he says, this is encapsulated in the slogan “design to demise”. Reddy adds that improving our ability to track the fall of such objects is also of use to meteorite hunters. Incoming space rocks are initially easy to track because they light up the sky with bright streaks that show exactly where they’re going. But then, somewhere around 20 to 30 kilometres up, they slow enough that they are no longer visible: a part of their trajectory Reddy describes as “dark flight”. Luckily, he says, weather forecasters now make extensive use of Doppler radar. Not that American scientists could then go pick up the meteorite. “It belongs to the Cuban people,” Reddy notes. The same techniques, he adds, can be used to track, and quickly find, space debris falling to Earth. International law then dictates what happens to it, but the first step is to find it, particularly if it contains hazardous materials, before someone gets hurt. “What reassures most,” he says, “is knowing we have a plan”.